Looking for someone to run with on your very first run? Looking for someone to push to you to your personal best yet? Well…..look no further than our genial and gentle Khuzem Lal. He is the ‘Partner’ at Dream Runners. From the start line to the finish, he will guide you, cheer you, and push you to your limits to bring out your best. A runner with no mean achievements of his own, he is always ready to put his run on the back burner for the sake making someone else achieve. He has many marathon finishes to his credit. A regular sub 5 hour runner for the full marathon, he clocked his best of 4:26 at TWCM 2014. He also has a sub 2 finish, 1:59, for a half marathon at the Auroville event in 2013. More recently, he has run many 10k races, regularly clocks sub 1 hour times comfortably and was a Podium Finisher at Marina Runners Event. 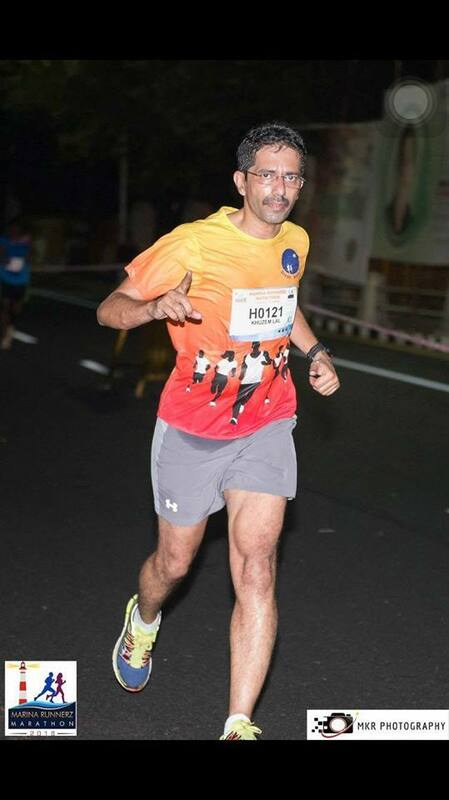 He has mentored the Anna Nagar chapter of Dream runners – Anna Nagar Dreamers from its humble beginnings. It is now a vibrant and active chapter of Dream Runners getting more and more first time runners into their fold. The Race Director for the DRHM 2015 edition, he showcased his managerial and organizational skills to guide the event to great success.